I like London except that some places are way more crowded than I would prefer. The good things with London is the shopping (I’ll write a separate post about that tomorrow), musicals, afternoon tea, the historic atmosphere of all the beautiful buildings and of course I can speak English! After being back in Sweden for 3,5 years I do miss not being able to speak it regularly. In London it’s a little weird though because you actually hear Swedish “in every corner”. Lots of Swedes visit but also live there. Yes, you saw correctly that is water! 🙂 I’ve never liked beer, wine or anything containing alcohol. I’ve tried several times but it just taste yucky to me. 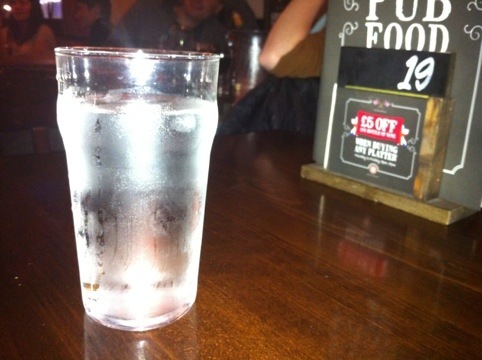 I do find it a little boring drinking water in a pub though. Now you’re probably wondering why I don’t drink a soda at least and the answer to that question is “yuck” as well. Ever since I started my RA medication 3 years ago I don’t like certain food/drinks that taste too sweet. I’ve not totally given up on trying to learn to drink alcohol but nowadays I need to be extra careful due to the medication I’m taking.